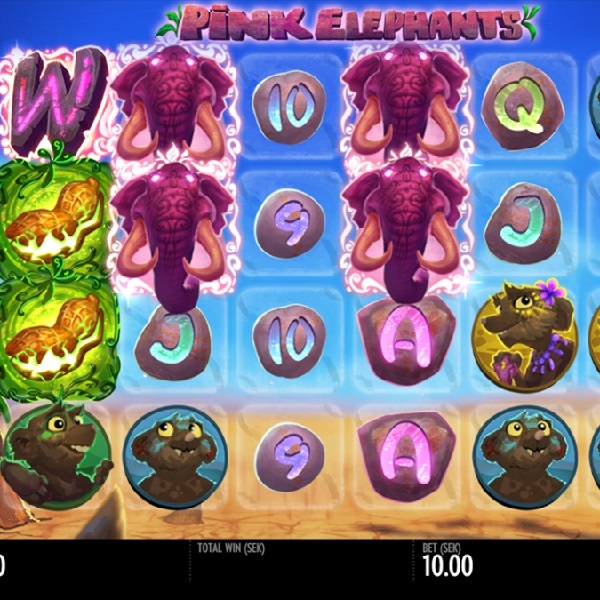 Thunderkick Gaming have just released Pink Elephant slots, a game that offers a huge number of free spins and the chance of large winnings. It is a 6 reel slot with 4096 ways to win. The reels are set against a desert landscape and the symbols include the pink elephant and four different small creatures coloured red, yellow, green and blue. There is a large purple ‘W’ wild symbol and a peanut scatter. If you land three, four, five or six scatters anywhere on the reels you will receive 7, 11, 15 or 19 free spins respectively. During the spins you need to collect elephant orbs that help fill up meters for each symbol. When a meter is full all instances of its symbol become elephants and more free spins are awarded. In the base game it is possible for up to five scatters to be added to the reels at random to help and trigger the feature.